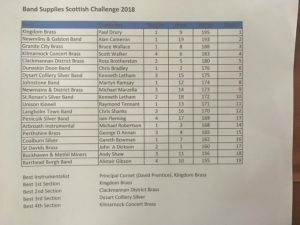 Yesterday the band contested up in Perth at the Band Supplied challenge cup. The band came in a respectable 13th of 19 bands. Although we missed out on the top prize in the 4th section we are delighted with how we performed and the result we got! We could not have managed this without the skills, talent and hard work given by our Guest conductor Iain Fleming over the last couple of months. The biggest thanks go to him and his family for finding the time to allow us to do this!! Ooops! I will update right now. But yes you are right its a great result and as Iain said any other year it would very much have been a win in the 4th section!